Heart's Delight Cards: SIMPLY AMAZING!!! Today I am thankful to be a part of this wonderful Stampin' Up! family. I about swooned when I saw this offer! You can get the ENTIRE starter kit (Regular or Digital), with $310-320 worth of products, for only $87.50, which is 50% off the regular kit price! That means getting about $225 worth of goodies FOR FREE! And, you don't have to pay for shipping on the kit, either!!! If ever you were thinking about joining, either as a hobby demo just to get the discount, or as an opportunity to make a little added $$ every month (for a monthly bill or a child's activity? ), NOW is the time to join! (Well, not NOW now, because it doesn't start until tomorrow.) ;-) This deal only lasts 2 weeks, from November 15-30. I've never seen it offered this low!!! What's the catch? None...you can keep everything, no matter what! There are no obligations whatsoever. Can you customize the kit? YES! There are choices on 21 of 28 items in the kit, so if you already have something in the kit, you can choose something different. Why is Stampin' Up! doing this? Because they love you..... and to help attain the goal they set of 10,000 new demonstrators for 2010. Need one more reason to "nudge" you toward joining my team? As a bonus from me personally, you will receive any product(s) of your choice valued up to $25.00. This won't be in your kit - it will come from me directly, so once you sign up, I will contact you and find out what you want! Earn my undying gratitude, and get helpful ideas/projects for a successful business from me. I'm here to help you any way I can! Get the monthly Stampin' Success magazine, full of tips and ideas for using the products and being successful. 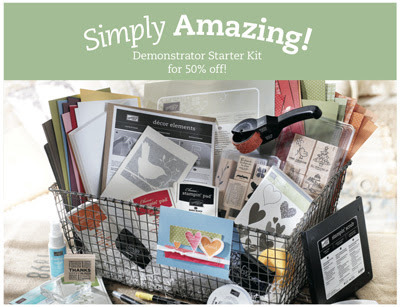 Never pay full price for your stamps or products again - everything is 20% off for demos! Make wonderful new friendships, and get paid top do what you love (I think this is the best part!). Flexibility - do as little or as much as you want, when you want. Need more reasons? Sheesh, you're a tough sell! Kidding!!! Just call me and learn more.